In celebration of 8/08 day and the Roland machine that changed the course of music, we present this definitive history on Roland’s TR-808 Drum Rhythm Composer. Make sure to also check out our 8/08 day celebrations in LA and NY with a chance to win a special edition Roland Aira TR-8! Few musical instruments have changed the face of music. Les Paul’s electric guitar, Bob Moog’s Mini Moog and Leo Fender’s electric bass guitar come to mind. The Roland TR-808 entered the club in 1980. Not only did its analog drum sounds become the most identifiable and widely used drum machine sounds of all time, its form and function were revolutionary as well. Since its initial release in 1980 to poor reviews (including a Keyboard magazine review comparing its sound to marching anteaters) the TR-808, or 808 as it is known, has cemented its place as the most important and ubiquitous drum machine sound in modern music. TR-808 segment from The Shape of Things That Hum, a synthesizer documentary from 2001 that aired on the BBC’s Channel 4 in the UK. The list of 808 users is so long that its sound has stayed relevant through three decades. The first recording to feature the 808 is the 1981 album BGM by Japanese synthpop superstars, Yellow Magic Orchestra. The record that broke the 808 in the hip hop and dance music underground was Afrika Bambaataa’s “Planet Rock,” produced by Arthur Baker who went on to make hits with New Order. Marvin Gaye’s hit “Sexual Healing” helped introduce the 808 sound to the mainstream. 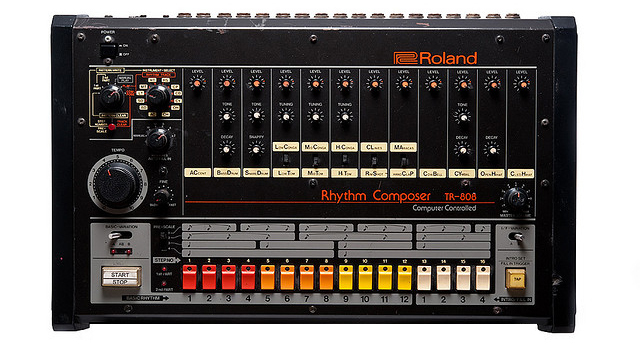 By 1986, the 808 had become a staple of hip hop, even though the machine was discontinued in 1983. The Beastie Boys debut album, License to Ill, features 808 drums on nearly every song. Prior to the release of the 808 and its contemporaries, most drum machines were preset rhythm machines with uninspiring sounds. Some were built into home organs, while others catered to working musicians who needed a beat when a drummer was not available. Mere months before Roland released the 808, Roger Linn released the revolutionary Linn Drum LM-1, the first drum machine to use samples of real drum sounds as its primary sound source. This was the biggest breakthrough in drum machine technology at the time, and it overshadowed the relatively quiet release of Roland’s TR-808, which used analog synthesis to create sounds that were nowhere close to real drums. However, what the 808 lacked in sound, it made up for in economy. With the price of the LM-1 close to $5000, the 808 was a relative bargain at $1199. It was an advanced and feature-heavy drum machine for the money, and soon found itself gaining popularity in the infant hip hop and dance music scenes. Its popularity further soared as it became easier to acquire in used equipment shops and pawn shops. The 808 is composed of 16 analog drum voices. The signature booming bass drum, spacey cowbell, and sharp, snappy snare are immediately identifiable to most listeners. Its robust sounds, while reminiscent of earlier drum machines like the CR-78, are a significant departure from the cricket sounds of the home organ rhythm machines. Unlike earlier machines, the sounds can be customized with editable parameters such as tuning, decay and tone (filter cutoff). Each voice can be mixed through a single mono output, or sent to individual outputs, allowing for each sound to be processed separately. 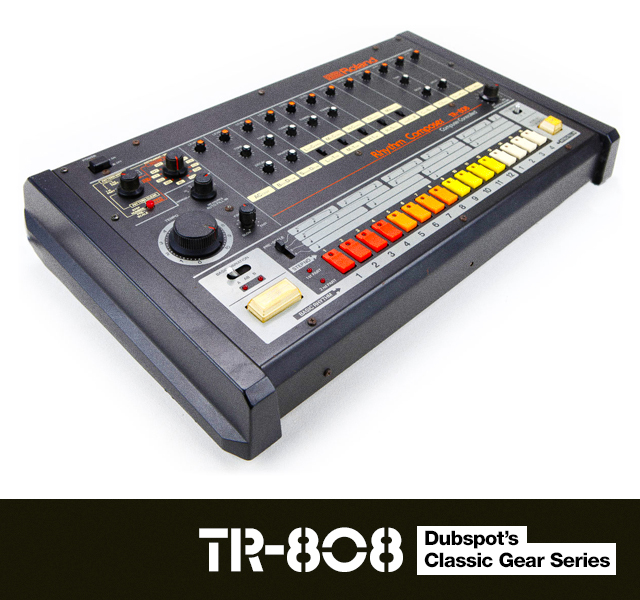 The 808 is also the first appearance of the fully formed Roland “TR” style sequencer, which went on to be included in most of Roland’s future drum machines, and became one of the most emulated sequencer designs of all time. The design, which allows 32 steps per bar, features a set of 16 buttons, each with a red LED. Each button represents one step in the sequence. The large knob to the the top left allows the user to select the voice to be programmed. When play is pressed, the red LEDs chase from left to right, signifying the sequencer playing through each step in the sequence. When a button is pressed, it’s LED lights up, and the step plays the selected sound. The buttons also double as pattern select buttons, a feature that allows the user to improvise between different patterns in real time. Due to its age, the 808 does not include MIDI, but it can be synchronized to other devices via Roland’s DIN Sync format, and companies such as Kenton make MIDI retrofits. Given these options, and the fact that many users simply sample the sounds or synchronize the audio using the tools in modern DAWs, the lack of MIDI is not a big deal for most 808 owners. The sound of the 808 is such a staple that samples of it are found in just about every drum machine sample bank, and in the sound libraries of most software. For those who can do with no less than real analog, there are some 808-like hardware emulations. German synth manufacture MFB has made a number of hardware drum machines based on the classic Roland TR drum machine line, most notably the MFB-522 which features a mixture of analog and sampled voices. The Acidlab Miami is a fully analog emulation, and is also true to the layout and design of the original 808. The Beastie Boys’ debut album, License To Ill features the the 808 in nearly every song. Dubspot guest blogger Ross Kelly is a Chicago based DJ, Producer and synth guru. He is a one half of Night Moves, a cosmic disco party at Danny’s in Chicago. He is also Partner at Kokorokoko Vintage, an 80s and 90s themed vintage clothing shop in Chicago.